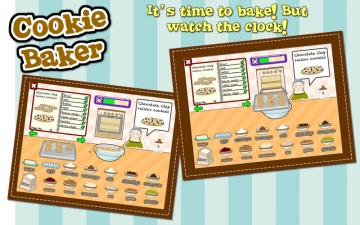 Cookie Baker | Mac App Storeのアプリ検索・ランキング BuzzMac! Get in your very own kitchen, it's time to bake some cookies! 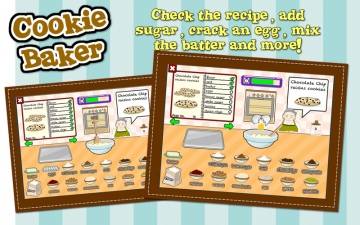 Mix many kinds of ingredients and bake according to the chef's recommended recipe book. 20 Different kinds of recipe! Touch and drag the various ingredients into the mixing bowl. Enjoy cracking eggs, mixing the dough using the spatula and more just by using your fingers! After your dough is set, scoop them up and put them on the baking tray. Then take the tray and put them in the pre-heated oven and wait for it to bake in a few short seconds! Once its done serve them to the waiting customer! But watch the clock and don't let the time slip you by. The faster you bake and serve your customers the happier they'll be and the higher your rewards. 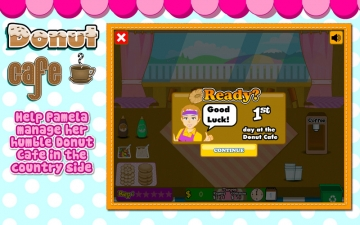 If your kids love cooking and baking games like Cooking Mama or Cake Doodle; they will enjoy playing Cookie Baker!